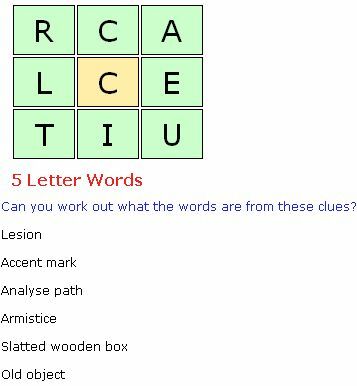 The word builder is an interesting word puzzle that combines elements of the word wheel with elements of the crossword. In common with a crossword, there are a series of clues at the start of the puzzle. However there is no grid! Instead there is a set of letters - usually nine - and from these the words must be made as they are all anagrams of the words. And like with a wordwheel, each word uses the central letter once. The words are split into their lengths as a clue. These puzzles are not only enjoyable puzzles for adults, they also make very good educational puzzles for those looking to build their vocabulary, whether it be they are in the process of learning English or are children.